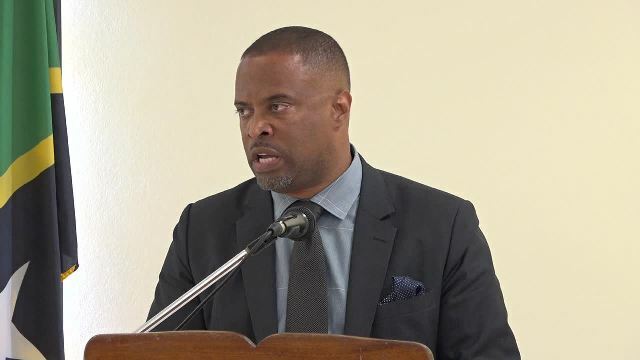 CHARLESTOWN, Nevis – At his first monthly press conference at the Cabinet Room at Pinney’s Estate, the Honouranble Mark Brantley, premier of Nevis and minister of education, said a greater number of young people should take advantage of fully-funded scholarships offered by the Caribbean Development Bank (CDB). He said he had been notified by a team of CDB consultants that they had been having difficulty finding people willing to take advantage of the scholarships. Brantley explained that the team of CDB consultants were visiting in regards of the Technical and Vocational Education and Training (TVET) Enhancement Programme. In 2015, the government of St. Kitts and Nevis accessed financing from the CDB to implement the TVET Enhancement Programme. The Board of Directors of the CDB approved US$8.3 million in financing support to the government in enhancing its technical and vocational education system to improve national productivity, drive economic development and boost competitiveness. The TVET Enhancement Programme aims to improve the quality, relevance and efficiency of the TVET system, in an effort to help narrow the gap between the demand for and supply of skilled labour. Meantime, the premier also urged people to ready themselves to be a part of the project moving forward. He said much has been bantered about regarding the lack of skills certification, but the project offers certification for those in and out of school. “So, if you are out here as a welder or as a carpenter, they will come and assess you and you will get your certification without you necessarily having to go back to school,” he said. “They will come and look and see what quality of work you are producing because, let us face it, we have some very skilled people on the island, some people who can build a whole house, but you ask them for that bit of paper and they have none. “I am also very happy to report that I have been advised by the CDB consultants that those who are no longer in school, but who are described as those out there performing the skills, but without certification, the TVET programme will also now allow them to be certified,” he said.